The exterior of a Bald-faced Hornet nest consists of an outer envelope of paper that is made up of a myriad of horizonal stripes of chewed up wood fibers that have been mixed with hornet saliva. Each stripe represents a single hornet’s contribution. The different colors represent different sources of wood. This outer envelope is only one of several (up to 12 or more) that serve to insulate the innermost, active part of the nest. Inside these outer sheets are three or four horizontal tiers of hexagonal cells in which eggs are laid and brood are raised. Access from one level to another is at the periphery of the tiers, just inside the shell. The queen begins the nest, building a few cells and raising female workers that then take over the cell-building while the queen continues to lay eggs. As the number of hornets increases, so does the number of cells they build, and as a result the tiers become wider and wider. When space runs out, the hornets remove one or more of the innermost layers of insulating paper that form the envelope, while constructing new sheets on the outside. The nest continues to grow in this fashion until the queen’s egg-laying slows down at the end of the season. The construction of these tiers of cells takes place upside down in total darkness, which is, in itself, quite a feat. When they are constructing a cell, the hornets keep one antenna inside the cell and the other on the outside. By monitoring the distance between the two antennae tips they can judge thickness of the wall. They do a similar thing with their mandibles, with one on each side of the wall, in order to straighten the cell walls and squeeze the pulp flat to remove water. If the cells were built sideways or upwards they would require constant attention from the hornets until they dried in order to prevent them from sagging. Given that the cells are downward-facing, one might wonder why the hornet larvae don’t fall out. Water has a great affinity for uncoated paper (think of paper towels sucking up water against the pull of gravity). Because the larvae are damp, they actually stick to the paper cell walls. When they are ready to pupate, they must separate from the walls. They do this by attaching themselves to the cell with silk and then spin a silk cocoon. 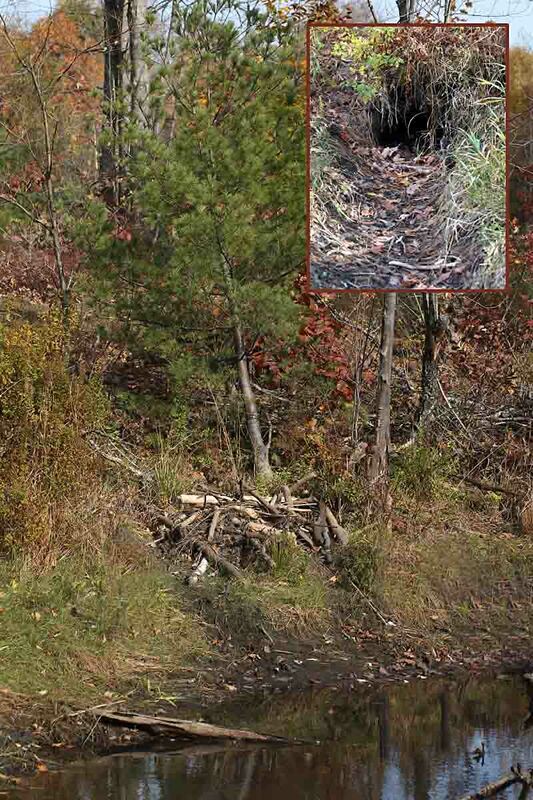 What exactly is it like inside an active beaver lodge in winter? It’s dark, damp and around 32°F. The living chamber inside usually has a ceiling no more than two feet high with a diameter of 4 to 6 feet, depending on the number of individuals in the family. (A typical beaver family is composed of an adult male and female, 2 to 3 yearlings, and 2- 4 kits that were born in the spring.) Fresh air enters and carbon dioxide leaves through a central vent (where mud is not applied) and through small holes that remain under logs on the side of the lodge. When there isn’t much snow and the outside air falls well below zero, the temperature inside may drop to a degree or two below freezing, but if the sun is out, it warms right back up again during the day. 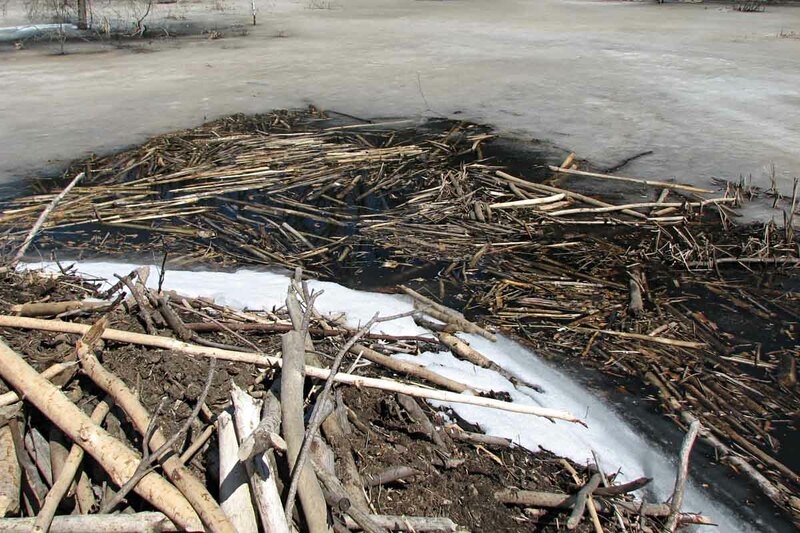 The dampness is due to the beavers’ repeated need to enter the water both to retrieve sticks from their nearby food supply pile and to defecate. Upon returning to the lodge, the humidity inside increases due to the water draining from the beavers’ fur. No small wonder that if a January thaw permits, beavers will exit their pond for some fresh air, food and a little bit of sunshine. 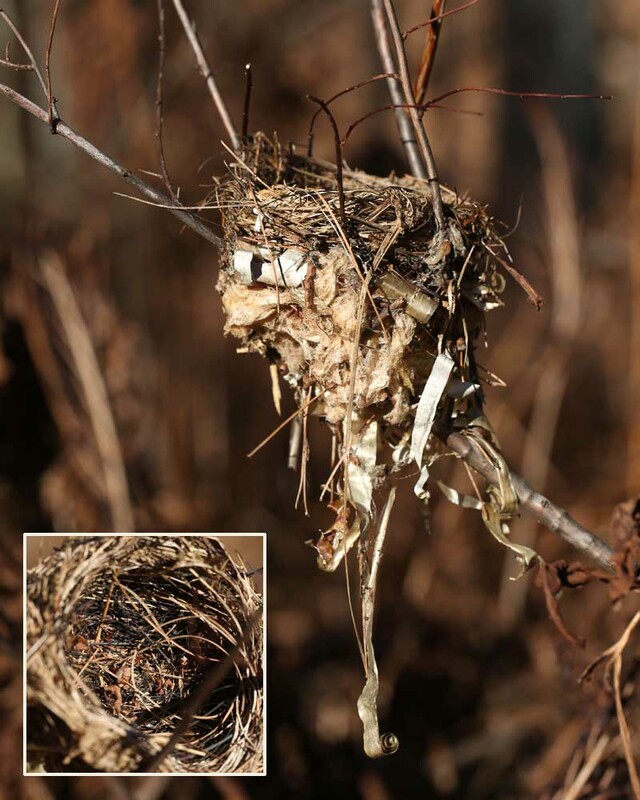 When leaves start falling from deciduous trees, bird nests appear out of nowhere. Most songbirds abandon their nest after raising one brood, never to return to it. 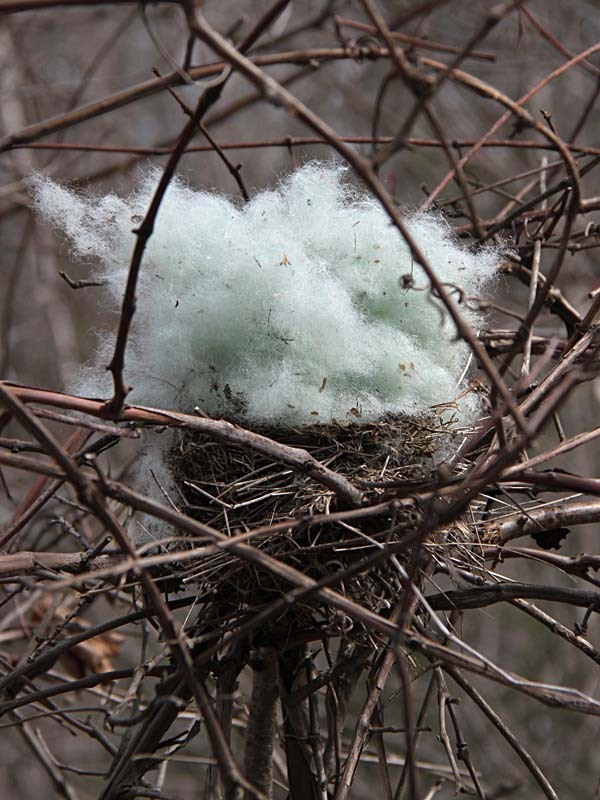 An empty nest sits where it was built until the elements break it down, another animal recycles the material from which it was made, or a mouse takes over winter occupancy. The period of time after the leaves fall and before winter and other creatures deconstruct the nests is ideal for discovering who raised their young under your nose this past summer. Is there a youngster in your life who might love his or her own book about beavers? 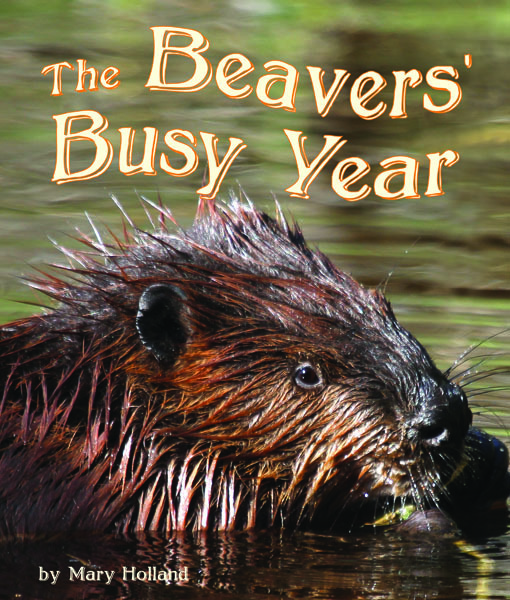 My third children’s nature book, The Beavers’ Busy Year, has just been released. Having been an ardent admirer of this rodent for many, many years, it is gratifying to have had a chance to instill a love for beavers in youngsters age 3-8 with this non-fiction book. The adaptations of beavers’ noses, eyes, ears, fur, feet and tails are highlighted in the text and photographs take the reader through the seasons of the year from a beaver’s perspective. Activities at the end of the book engage children in matching photographs of various beaver signs such as tracks, scent mounds and incisor marks with written descriptions. There are also activity/informational sections on beaver tails, beavers as engineers and creators of habitat for other wildlife, and dam building. It should be available at your local bookstore, but if not, I’d greatly appreciate your letting them know about it. Thank you!